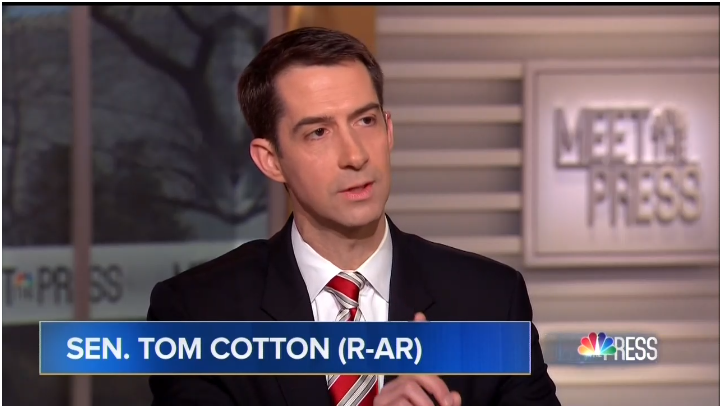 Republicans like Senator Tom Cotton (AR) are absolutely terrified of freshman Rep. Alexandria Ocasio-Cortez (D-NY), and their repeated attacks on her and her idea for a Green New Deal to address the issue of climate change have gone from disingenuous to downright absurd. Ocasio-Cortez unveiled her Green New Deal resolution this week, along with Senator Ed Markey (D-MA), and to hear Cotton tell it, such a plan is pure socialism and will end with the Gestapo. Apparently, if one dares to call themselves a democratic socialist, that means they really want to install national socialism such as the Nazis instituted in 1930s Germany. Such a ridiculous view of progressive ideas completely ignores the fact that most European nations have some form of socialism, including national health care and other benefits that are good for all citizens and make their economies among the most vibrant in the world. Churchill gave the infamous “Gestapo Speech” while running against Labor in ’45. He got crushed and despite his warnings, the left gave Britain the National Health Service but Prince Harry did dress up as a Nazi for Halloween that one time. It’s also instructive to recall that Churchill wasn’t quite the extremist Cotton made him out to be. As a matter of fact, he was often on the cutting edge of matters that concerned the future of Western democracy. Wouldn’t it be nice if Republicans did just a smidgen of research before they posted specious, banal BS on social media? And yes, we’re looking RIGHT AT YOU, Donald Trump!